A famous and venerable oak (Quercus pseudo-coccifera) which still stands at Mamre, half an hour's journey west of Hebron, and is surrounded by a wall over which it projects. Josephus probably refers to it ("Ant." i. 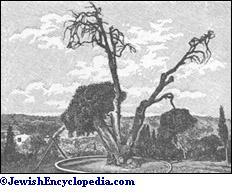 10, § 4), or a predecessor on the same spot, when he mentions that Abraham dwelt by an "ogygian" (prehistoric) tree. 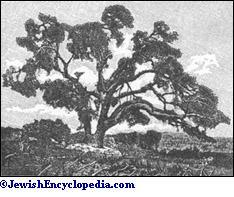 According to tradition, it was opposite this oak that Abraham's tent was pitched at the time that the angels came to him and promised him a son and heir; also when he was negotiating with Ephron the Hittite for the cave of Machpelah (Gen. xviii. and xxiii.). Some have connected the oak with an earlier stage of tree-worship. In Jerome's time, fairs were held under it. 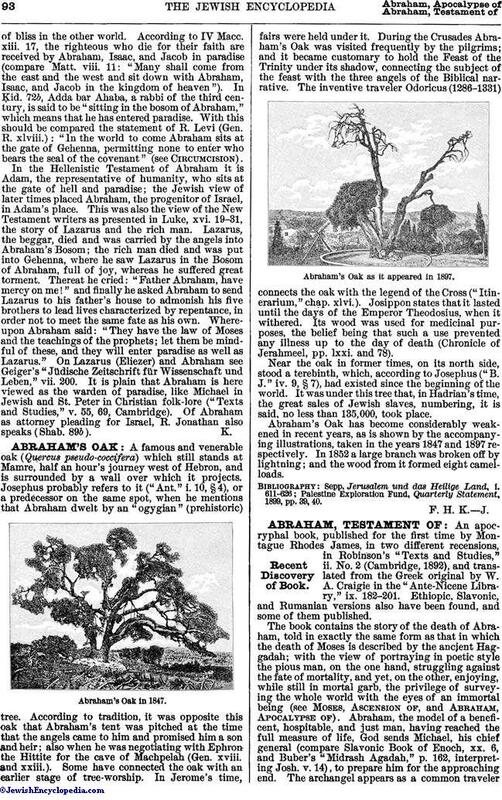 During the Crusades Abraham's Oak was visited frequently by the pilgrims; and it became customary to hold the Feast of the Trinity under its shadow, connecting the subject of the feast with the three angels of the Biblical narrative. The inventive traveler Odoricus (1286-1331) connects the oak with the legend of the Cross ("Itinerarium," chap. xlvi.). Josippon states that it lasted until the days of the Emperor Theodosius, when it withered. Its wood was used for medicinal purposes, the belief being that such a use prevented any illness up to the day of death (Chronicle of Jerahmeel, pp. lxxi. and 78). Abraham's Oak as it appeared in 1897.